Tsubomi Hanasaki is an eighth grade girl who loves flowers and plants. One day, Tsubomi has a strange dream. Beautiful flowers bloom on a large tree. At once all the flowers begin to wilt, and from there two fairies take off. A few days later. Before Tsubomi transfers to Myoudou Academy, the fairies from her dream appear! 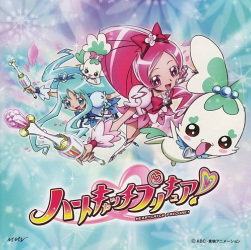 The fairies beg Tsubomi to become the legendary warrior Pretty Cure and protect the Great Tree of Hearts to make everyone's Heart Flowers bloom! Tsubomi doesn't think she can do something like that, and refuses. However, suddenly a mysterious enemy attacks, and the "Heart Seed" of her new classmate Erika Kurumi is taken away. To save Erika's heart, she has no choice but to fight as Pretty Cure! Tsubomi summons the courage she needs and transforms!! 14; an eighth grader attending the private Myoudou Academy. Loves flowers more than anything, and plans on becoming a member of the gardening club, but joins the fashion club upon getting to know Erika. Has difficulty with her introverted personality, and is thinking of using her transferring as an opportunity to change herself. When she was very young, she was influenced by her grandmother who raised her while her parents were busy with work, and she is quite skilled at proverbs and idioms. Her catchphrase is "I can't stand it anymore! (Watashi, kanninbukuro no o ga kiremashita!)" 38. Was a college professor in botany research, and went on many business trips, but quit his job and opened a flower shop in Kibougahana to spend more time with Tsubomi. 36. Worked at a famous flower shop called Red Florian, where many celebrities and famous people did business. Was often absent from home with her husband Youichi, but quit her job and opened a flower shop in Kibougahana to spend more time with Tsubomi. 67. A famous botanist who's the head of a botanical garden, and researching the Great Tree of Hearts. Once was the legendary warrior Cure Flower, and understands Tsubomi and Pretty Cure well. 13; an eighth grader attending the private Myoudou Academy, and president of the fashion club. Has a cheerful, positive personality, but has a hard time expressing what she feels in her heart. Feels inferior to her beautiful, extraordinarly stylish older sister. Her catchphrase is "Even my heart, wider than the ocean, reaches its limit in patience here! (Umi yori hiroi atashi no kokoro mo, kokora ga gaman no genkai yo!)" Erica: Scientific name for "heather"
One of the world's top-class cameramen, and is very passionate about talking about photography. Won many international awards when he was young. Also helps out at Fairy Drop. Formerly a charismatic model for a famous brand called Paris Collection (PariColle), she is now owner and designer of Fairy Drop. 17. An eleventh grader at Myoudou Senior Academy. An active high school-age charismatic model. Was scouted when she was in elementary school, and appeared in many teen fashion magazines, but now models exclusively for BiBi. 14; an eighth grader attending the private Myoudou Academy. Strives to train so she can take the place of her sick brother in succeeding what remains of the Myoudouin school, and consequently dresses up as a boy at school, but really does love cute things. Besides serving as the student council president, she's joined the fashion club upon being invited by Tsubomi and Erika. Her catchphrase is "I'll illuminate the darkness of your heart with my light! (Sono kokoro no yami, watashi no hikari de terashite miseru!)" Founder of Myoudou Academy and instructor of the Myoudouin school. Coaches Itsuki and his other pupils strictly, but kindly watches over them. Worries that Itsuki works too hard to be strong, but is happy seeing she's started to be more true to herself. Supports Itsuki in anything she wants to do. Eldest son of the Myoudouin family. 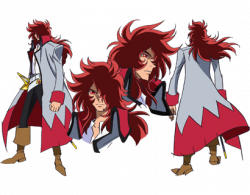 Has a weak constitution, and worries about his sister, who is taking his place in succeeding the Myoudouin family. Never seen without a gentle smile. Health begins to get better after an operation. "Atsumare, hana no power!" "Blossom Tact!" "Marine Tact!" "Atsumare, futatsu no hana no chikara yo!" 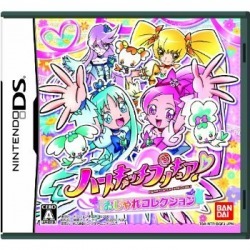 "Pretty Cure Floral Power...Fortissimo!! Heartcatch!!" Firmly believes her husband will come home someday. Works at a train station store. Went missing three years ago while searching for the Great Tree of Hearts. "Atsumare, hana no power! Moon Tact! Hana yo, kagayake! Pretty Cure Silver Forte Wave!!" "Atsumare! Kagayaku hana no chikara yo! Pretty Cure Floral Power Fortissimo!!" A fairy who protects the Great Tree of Hearts. 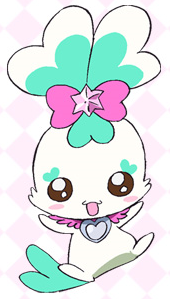 Knowing Tsubomi to be chosen by the Great Tree of Hearts as a legendary Pretty Cure warrior, she gives her a Pretty Cure seed, allowing her to be Cure Blossom. She becomes Blossom's companion, but normally pretends to be a stuffed animal. Has the ability create Heart Seeds. If the Heart Seeds are collected, something amazing will happen... Has a quiet personality. Acts as an older sister to Tsubomi. Ends sentences in "desuuu." A fairy who protects the Great Tree of Hearts with Chypre. Knowing Erika to be chosen by the Great Tree of Hearts as a legendary Pretty Cure warrior, he gives her a Pretty Cure seed, allowing her to be Cure Marine. He becomes Marine's companion, but normally pretends to be a stuffed animal. Has the ability create Heart Seeds like Chypre. Has a mischevious personality, borderline insulting at times and very sweet at others. Acts as a little brother to Erika. Ends sentences in "desu." Coffret: French term for a small box or chest. A fairy born from the Great Tree of Hearts. Chose Itsuki as his partner after searching for one. He's still a young child, so he's selfish and a bit of a crybaby, and causes Chypre and Coffret a lot of trouble. Ends sentences in "deshu." 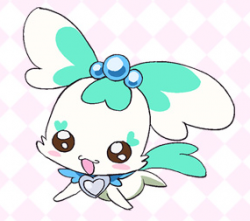 A fairy who acted as Kaoruko's companion when she was Cure Flower. Chypre, Coffret, and Potpourri look up to him as their superior. 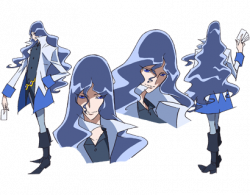 He's also the true identity of the mysterious young man who used to save Cure Blossom & Marine when they were in trouble, He took on the appearance of Kaoruko's deceased husband, Sora, wanting to support her heart. Coupe: A wide glass dish, often used to serve a fruit-flavored ice dessert of the same name. 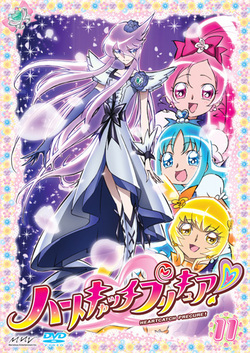 Cure Moonlight's former companion. Took on one of Professor Sabark's attacks to protect her, and was killed. His spirit now watches over Yuri from the Great Tree of Hearts. One of three executives. An intense narcissist, thinking himself to be the most beautiful man in the universe. Uses the Sunakeys to always look as beautiful as he can. One of three executives. A passionate martial artist who speaks in Tosa dialect. Always trying to think of special attacks. One of three executives. 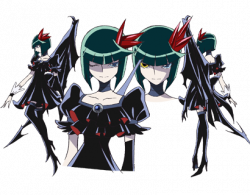 An impulsive type, and challenges Pretty Cure with all her emotion. Good at using her hair to attack like a tail. Boss of the Desert Apostles with an unseen face. Trying to kill the Great Tree of Hearts by using the executives to desert every human heart so he can rule the world. 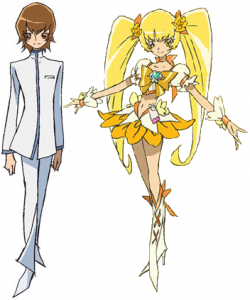 Responsible for the initial defeat of Cure Moonlight along with Dark Pretty Cure. Sabark's right hand. Hides immeasurable power, but her personality has mysterious aspects. The executives' servants. Always hard-working. Tsubomi's grandmother. 67. A famous botanist, and head of a botanical garden Tsubomi likes to visit. Knows Tsubomi and Pretty Cure well. Actually, a long time ago as a high school student, she was a very strong Pretty Cure named "Cure Flower." Nee Godai (五代). The Desert King who rules over the Desert Apostles. Cure Flower took his power away when they fought in the past. Tsubomi Hanasaki is moving to Kibougahana. Tsubomi is an eighth grade girl who's thinking of changing her introverted self. Upon transferring into her class, she tries to act energetic...but she can't keep up with the pace of powerfully energetic girl Erika Kurumi. Is this a fated meeting?? But their compatibility might be the worst! "I'm not good with these kinds of girls!" Erika forces Tsubomi to change her look at her house. Unable to tolerate it, Tsubomi brutally tells Erika off and leaves. Gazing at the town alone, strange fairies named Chypre and Coffret appear. Then Sasorina, an enemy pursuing them, attacks the nearby Erika! Seeing what's happened, Chypre and Coffret give Tsubomi a transformation item and tell her she needs to become the legendary warrior Pretty Cure!! Not understanding anything, Tsubomi has transformed into Pretty Cure. But she just runs away from the attacking Desertrian, and can't do anything. Is this really the legendary Pretty Cure warrior? Could she be the weakest Pretty Cure in history?! In front of the anxious Chypre and Coffret, Sasorina finally captures her with her whip-like tail. It's no use... At that time, a mysterious and super-cute guy appears in a whirlwind of roses...? Tsubomi wakes up in the greenhouse of her grandma Kaoruko's botanical garden. Erika is still sleeping inside the crystal ball. Then the Desertrians pursue Blossom again, trampling the garden! Tsubomi transforms into Pretty Cure again, and concerned about the flowers her emotions explode out. This time, Blossom faces the Desertrians with an overwhelming strength. And she releases the agreed technique taught to her by Chypre: Pretty Cure Pink Forte Wave!! Recently, Erika has been having bothersome dreams - dreams of Cure Moonlight's defeat. Tsubomi has had the same dream. So that means Erika qualifies to become a Pretty Cure, too?! The second Pretty Cure?! But right now fashion club is more important than Pretty Cure. If three more people don't join, the fashion club will have to stop!! Erika takes Tsubomi with her and rushes to invite people, but no one is sure... At that time, downhearted seventh grade girl Sayaka Uejima catches sight of the two. Sayaka wants to join the soccer team, but can't, and her heart is full of frustration. The Desert Apostles notice her feelings, and pull out Sayaka's Heart Flower. Her worry becomes a giant soccer ball Desertrian and goes on a huge rampage! Tsubomi transforms into Pretty Cure, and although she faces it by herself, she's brushed off by the Desertrian's rotating attacks! It's useless! 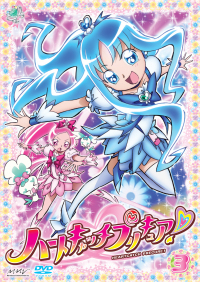 Seeing Cure Blossom like this, Erika finally decides to be a Pretty Cure!! Desert Apostle executive Kumojacky has appeared! Kumojacky is a passionate man who speaks in Tosa dialect. The two Pretty Cures cooperate to defeat the Desertrian, but Blossom strikes Marine's leg and puts them in danger. Somehow they defeat the Desertrian, but Tsubomi is saddened. Comparing herself to the amazing Erika, able to do anything, she thinks she isn't of any help. "I'm not qualified to be a Pretty Cure. It'd be better if the combo were to break up..." She's crying on Coupe's chest in the botanical garden when her grandma shows up to encourage her. She says the only requirement to be a Pretty Cure is a kind and strong heart. Meanwhile, Kumojacky takes the Heart Flower of Mao from the tennis team. A roller machine Desertrian is kicking the vegetation in the park around! Cheered up by her grandma's words, Tsubomi finds Erika! They transform immediately, but Blossom is only protected by Marine. She doesn't seem suited to be Marine's partner... Can the two combine their hearts into one and unleash their combined attack...?! Erika loves good ramen. "Miura Ramen" is a very delicious ramen restaurant. She's overjoyed knowing there's going to be two ramen shops in Kibougahana! The day the shop opens, she immediately goes with Tsubomi and has lots of fun. The son at Miura Ramen, Akira Miura, helps out his hard-working father with utmost effort. But when Erika asks, he tells her not to come! Why on earth can't he help his father...? Tsubomi is worried about Akira. Meanwhile, at Dr. Sabark's hideout, the three Desert Apostle executives are waiting for their turn. This time it's model-like super narcissist Cobroger. He thinks himself to be the most beautiful person in the universe. He comes to Kibougahana and decides to take Akira's withering Heart Flower! Cobroger takes the Heart Flower from him and changes some ramen into a Desertrian. Rushing to the shop, Tsubomi and Erika become Pretty Cure and try to protect the ramen shop from the Desertrian! Shouting that he wants the ramen restaurant to disappear, the Desertrian tries to smash the shop. However, Blossom strikes it to make it stop, and tears come from the Desertrian's eyes! ...Why?? Blossom and Marine will protect the bond between father and son! Lots of photos are put up on the wall at the back of the classroom. The one who took them is Kanae Tada, a classmate who's always trying to get the scoop. She declares that next time, she'll get the scoop on Pretty Cure, and Tsubomi and Erika are shocked. Kanae has started getting info from classmates who say they saw Pretty Cure. And at last! She comes to Erika's house. Have their identities as Pretty Cure been exposed?? It'd be terrible if they were! Kanae talks to Erika's dad at her house. Erika's father, Ryuunosuke, is an international photographer. Showing him her photos, she's shocked at her role model Ryuunosuke's unexpected advice. She's downhearted, when Sasorina appears and takes her Heart Flower and camera! The camera-turned-Desertrian freezes the opponents it takes photos of. After transforming into Pretty Cure, Marine is frozen like a photo, too!! Now fighting alone, Blossom is in a pinch before the Desertrian! At that time, she hears Coffret shouting to use a Heart Seed. Blossom follows his directions. With that she's surrounded by a red light, and a new power is awakened...! The fashion club is in danger of being abolished! Somehow Tsubomi and Erika manage to scrape together the new club members, put down their names, and gone to visit the house of the student council president, Itsuki Myoudouin. Itsuki is practicing martial arts with some students. He looks really cool as a martial artist expert, and Tsubomi is entranced. Is this first love?! Tsubomi's heart is racing, but... Itsuki has a reason for acting brave. Deep in his heart, he has different hopes. Cobroger approaches him seeing his heart as an opportunity! He takes Itsuki's Heart Flower and changes a bronze statue in the schoolyard into a Desertrian. The Desertrian creates rays of light and turns the students and campus greenery into stone. Witnessing this chaos, Erika transforms into Pretty Cure! But having the heart of martial artist master Itsuki, the Desertrian is strong! Meanwhile, Tsubomi is shocked to learn the truth about Itsuki, and takes a day off from school. Can Tsubomi become Blossom and rush to Marine's side?! Unusually for her, Tsubomi is buying fashion magazines. She sees charismatic high school model Momoka on the cover and thinks she's super cute. Momoka is the most popular model right now! Everyone looks up to her for appearing in magazines and wearing cute clothes. But Erika is weary when she sees the cover. That's to be expected. Charismatic model Momoka is Erika's older sister. Erika doesn't like that everyone only pays attention to her sister. But at the fashion club, everybody suggests studying a photo shoot of Momoka. It is technically studying fashion, so Erika can't refuse. Not having a choice, she relays the request to Momoka. At the gorgeous photo shoot location, Tsubomi and her friends are super happy! Surrounded by her friends, Erika unexpectedly seems to be having fun as well. Glancing at Erika and her group, Momoka becomes depressed about the photo shoot. The Kumojacky appears, takes Momoka's Heart Flower, and creates a makeup Desertrian!! Without a moment's delay, Tsubomi and Erika transform into Pretty Cure, but they're shocked to hear Momoka's true feelings through the Desertrian's cries. 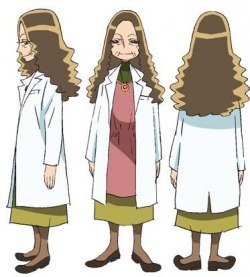 Tsubomi's father is now a florist, but a long time ago he was a college professor who taught botany. His student from those days, Obata, has come to talk to him, wishing to study under him once again. Erika is shocked that Tsubomi's dad was an amazing scholar! But Tsubomi's feelings are complicated... Tsubomi starts talking about how her mom and dad met. The two had a fateful encounter in a flower garden... Hearing they both fell in love at first sight, Erika is fascinated. One day, Obata asks Tsubomi to persuade her dad while she's walking home from school. Seeing this, Kaoruko starts talking about the reason he chose a flower shop over flower research. The truth is, it has to do with Tsubomi when she was young... Cobroger zeroes in on Obata's Heart Flower. He takes the Heart Flower and throws it at Obata's cellphone. A cellphone Desertrian appears, going on a rampage with its extremely loud ringtone!! 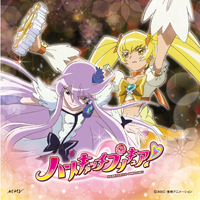 Tsubomi and Erika become Pretty Cure and fight it. But the super-speedy mobile Desertrian is tough to face! At that time, Cobroger's statement ignites Blossom! Frequent customer Mr. Toshioka comes to Tsubomi's shop. He plans to give a present of "eternally blooming flowers" and propose to the woman he loves. Tsubomi and her family pile together to make the proposal a success! But Mr. Toshioka doesn't seem confident... So Tsubomi tries inviting him to a barbecue. If they're busy having fun, the proposal is sure to be great! The day of the barbecue, Mr. Toshioka takes along his girlfriend, Ms. Risa. Tsubomi and Erika quietly watch over Mr. Toshioka and Ms. Risa on the suspension bridge in the forest where they were invited. Cobroger sees what's going on. He takes Ms. Risa's wilting Heart Flower and throws it into the river, and a water Desertrian appears! 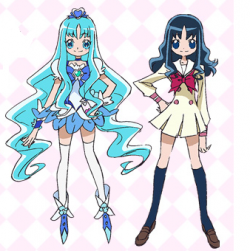 Tsubomi and Erika transform into Pretty Cure, but their punches and kicks don't affect the water Desertrian!! Moreover, Marine has been absorbed into the Desetrian! In this crisis, Mr. Toshioka, overwhelmed with love for Ms. Risa, does something amazing! Tsubomi is contacted by her grandma, Kaoruko, that "the agave has bloomed." Agave is a rare flower that only blooms once every ten years. Tsubomi hurriedly heads toward Kaoruko's botanical garden. There she sees Yuri Tsukikage. Yuri is the one who gave her advice when Chypre and Coffret were kidnapped by Dark Pretty Cure before. Tsubomi thanks her, but she acts coldly, saying "I only taught you the flower's meaning." At the train station, Dark Pretty Cure appears with the Sunakeys! Tsubomi learns of it from Erika's phone call and soon arrives at the station. However, Yuri rushes to the station before Tsubomi. Yuri's mother is at the station shop! She's protecting the lagging children and is frightened. Then Yuri arrives and, elegantly dodging the Sunakeys one by one, helps out her mother and the children in the blink of an eye. 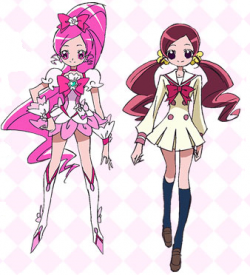 Once Tsubomi finally arrives, she and Erika transform into Pretty Cure! 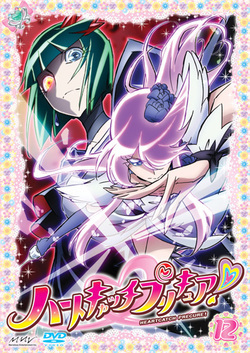 The two challenge Dark Pretty Cure, but for some reason she targets only Yuri. Why on earth...?! At that moment, Dark Pretty Cure says something to Yuri! Hearing her words, Blossom and Marine are shocked. She says...!? Mother's Day is coming up fast. Both Tsubomi and Erika's shops are super busy with customers looking for Mother's Day gifts! Tsubomi and Erika both want to give a great present to their moms, but they're worried that they don't know what'll make them happy. One day, Nanami, a classmate of theirs whose catchphrase is "A smile is the best! ", comes to Tsubomi's flower shop home. She comes with her litter sister, Rumi, saying she wants to give her mom carnations. Nanami and Rumi return home and decorate their mom's photo with carnations. Nanami's mother has passed away, and now she acts as Rumi's mother. But Rumi has a tantrum, saying she really wants to give them to her mom. Nanami is worried about this, too. Then Sasorina appears in front of Nanami. Her Heart Flower is locked up inside a little cage. Realizing this, she takes it out and throws it at a nearby cleaning tool. The Desertrian shouts Nanami's true feelings of loneliness and grief locked up in her heart. 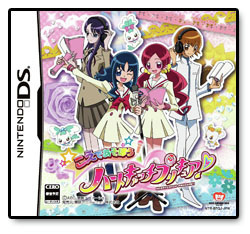 Tsubomi and Erika rush to the scene and transform into Pretty Cure, and attack using brooms and baskets as weapons!! Itsuki Myoudouin, the student council president whom everyone looks up to, has decided to visit the fashion club! She seems tempted by the designs that Erika draws. She draws a cute tunic outfit!! Everyone goes to buy materials for tunics right away!! From the start, the perplexed Itsuki's expression gradually brightens looking at the lace and cute ribbons! The next day, Itsuki is making a sample tunic. They're invited into her plain room. But when she shows them the inside of her drawers, they see...?! Itsuki is having a great time with Tsubomi and her friends. But then, a voice disturbs them, saying a challenge has appeared in the dojo. The girled up Itsuki turns around, prepared to fulfill her duty of protecting the family school. She exits the room with a stern expression. It looks like Hiroto, who cheated at the previous competition and was expelled from the dojo. Itsuki accepts Hiroto's match, with the school's sign as wager. The fate of this match is...?! Azusa Takagishi has come to the fashion club. Azusa is president of the theater club. Azusa tells Erika that the theater club clothing designs are detailed, too, and her fashion club spirit is ignited! Arguing over which fashion is more detailed, in the end Azusa challenges Erika to design stage costumes, and she accepts. They seem to be fighting, but Erika and Azusa really are good friends. Both of them are really motivated! With Erika's overwhelming determination, the members of the fashion club make have fun making a stage costume. Everyone contributes their opinion, and they make a really great dress! Meanwhile, in the theater club, Azusa strictly leads the members. They're all fed up with her attitude. Finally, they tell her that it isn't fun at all and leave. Shocked, Azusa's Heart Flower starts to blacken. Then Cobroger appears, throws her Heart Flower at the stage lighting, and a Desertrian appears. Pinned down by the Desertrian's beams of light, Pretty Cure can't move their arms and legs and are stuck!! Tsubomi and Erika visit the botanical garden where Kaoruko is, and finally meet up with Yuri again. They want to be friends with Yuri, their Pretty Cure senior. But she acts coldly to them. Kaoruko asks the three of them to go buy tea cakes for her. While on their errand, Tsubomi and Erika bravely talk to Yuri. However, Yuri says in a cold voice that she doesn't acknowledge them as true Pretty Cure. At the confectionary shop they go to, a parent and child are arguing about its famous daifuku. The father won't accept the daifuku that his son, Masahiro, has made. Tsubomi and Erika sympathize with Masahiro's frustration. They're Pretty Cure, too, and want Yuri to accept them! Tsubomi thinks she'll acknowledge them if they get stronger, but... Masahiro is downhearted at the riverside. 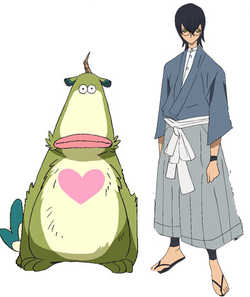 Then Sasorina approaches, takes his Heart Flower, and uses it to make a bean paste filled spatula into a Desertrian!! Then Blossom and Marine come rushing in. The Desertrian shouts out Masahiro's thoughts! Hearing them, Blossom is taken aback realizing what's really important. Thanks to planning on the part of Erika's dad, Ryuunosuke, Erika's family and Tsubomi go on a trip. They arrive at the farm where Mr. Horiuchi and his daughter Aki live. Here they help the two with jobs around the farm! Tsubomi and Erika are in super high spirits harvesting potatoes and tomatoes. Everyone noisily cooks freshly harvested vegetables, and they're placed in a row on the table!! The topic for the fun dinnertime is Aki, who will soon be wed. But...even though she talks happily, her face occasionally becomes gloomy. Cobroger sees that Aki's Heart Flower is weakening. He takes the Heart Flower, throws it at a farm scarecrow, and a scarecrow Desertrian appears. Without a moment's delay, Tsubomi and Erika become Pretty Cure and head to it. The Desertrian shouts out the gloomy-faced Aki's feelings! Erika's dad shows the Desertrian a photo, and it stops moving! The thing in the photograph...?! One day, Momoka asks Tsubomi to model for a magazine. Karin, a younger model, suddenly quit, and the staff is worried. Not having a choice, Tsubomi takes over and nervously heads to the studio. Secretly watching in sadness, Karin's Heart Flower is wilting. At the same time, the Heart Pot that Chypre and Coffret have with them starts to starts to glow! This is a sign that something amazing is happening! A third fairy, "Potpourri," is going to be born from the Great Tree of Hearts!! Then Professor Sabark and Dark Pretty Cure appear! They try to destroy the Great Tree of Hearts, when suddenly Potpourri rushes out and tries to defend it. The girls are challenged by the reckless Desertrian. But there, an unexpected crisis that hadn't been there before is waiting for them! Tsubomi, Erika, Chypre, and Coffret are in high spirits about the birth of the third fairy, Potpourri. 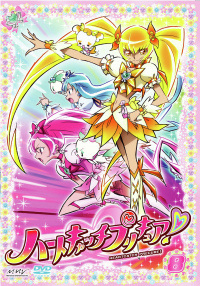 If Potpourri was born, there should be a third Pretty Cure, too. So Chypre, Coffret, and Potpourri set out to find a Pretty Cure. 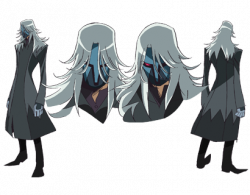 The three disguise themselves as a human and head toward Tsubomi and Erika's school. Full of vigor, the "Pretty Cure Recruiting Plan" is go! They do their best looking for Pretty Cure, calling out "We want you to be a Pretty Cure!" to everyone. Will they find the third Pretty Cure...? However, scoop-loving Kanae Tada takes a picture of the fairies' ridiculous disguise! Thanks to her, gossip has spread through the academy about a mysterious ghost appearing! Tsubomi and Erika's homeroom class investigates the "mysterious ghost" for the students, when Cobroger appears before Ms. Tsurusaki! The teacher is in danger! Tsubomi is not only in the fashion club, but also the gardening club where flowers are grown. The president of the gardening club, Aya Mizushima, is a clumsy girl and a bit of a crybaby. But she loves flowers more than anyone else! Worried that she can't take care of flowers well, Aya asks Tsubomi to let her talk to her grandmother, Kaoruko. Kaoruko tells her that it's important to spend her time carefully, with plenty of love. Aya is deeply inspired by her kindness! Seeing her like this, the fairies come to the conclusion that Aya is the third Pretty Cure. One day, a typhoon is approaching. The morning glories they've worked hard to grow might fly away! Tsubomi and her friends make a windbreak to protect the flowers from the typhoon. Then Aya discovers that the leaves of the morning glories she's been growing herself are wilting. Kumojacky appears before Aya, who has lost her confidence in growing flowers! Potpourri has found Itsuki, the student council president! Thinking he's a stuffed animal, Itsuki hugs Potpourri tightly and shouts about how cute he is. But at Itsuki's house, something more important is going on. Itsuki's older brother, Satsuki, is preparing for an important surgery. Satsuki is smiling no matter the occasion. Even so, as he thinks about the operation, he can't help but be scared. Itsuki is worried seeing her low-spirited brother. The day of the operation, Satsuki is trembling in his hospital bed. Seeing him like this, Sasorina takes his Heart Flower. A Desertrian with the form of a wheelchair appears in the hospital garden...! It's finally summer vacation! The fashion club is going to enjoy a summer camp in a beach house!! Of course, Itsuki is invited and goes, too!! Tsubomi and Erika are super happy as Erika's mom drives them in her car! Meanwhile, for some reason or another, Toshiko, Rumiko, Nanami, and Naomi from the fashion club are nervous. Itsuki, the student council president, will be there, so it's a bit stressful. Then Erika comes up with an idea for a makeover! She dresses up Itsuki in cute Fairy Drop clothes, and everyone becomes friendly with her. Making washed somen, thinking of clothing designs with everyone else, and answering all their questions... Everyone seems to be having fun. Itsuki looks like she's really having fun, too!! The next day, Itsuki is also invited by Tsubomi and Erika to a Pretty Cure camp. The three are running in the sand, when the three Desert Apostle executives appear! The Desert Apostles are training on the beach, too! 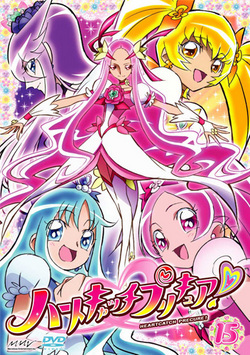 The three Pretty Cures and three executives confront each other!! The fashion club summer camp ends tomorrow. Itsuki is getting along great with everyone and having a fun time. But only Naomi, a member of the fashion club, has a sad look every now and then. She really looks up to Itsuki, but no matter what she says to her, it seems she can't connect with her. She'd like to be friends with her like everyone else... Tsubomi understands Naomi's disappointment and consults Erika, but... Naomi sighs and drinks tea from a thermos in the woods by herself. Then Kumojacky approaches. He takes Naomi's withering Heart Flower, throws it at the thermos, and a thermos-shaped Desertrian appears! Realizing something strange has happened, Itsuki transforms into Cure Sunshine. Blossom and Marine come running after her. Itsuki is disturbed realizing the Desertrian's shouting voice is the voice of Naomi's heart, and is hit by its attacks. The fun summer break will be ending very soon. Erika, who has just spent it goofing off, is still neglecting her homework! One day, Tsubomi and her friends are walking in the park, when suddenly a Desertrian comes toward them! It's a stationery Desertrian!! The three Pretty Cure transform and get ready. However, it's defeated with one hit from Blossom. Dumbfounded, they help the people, and new Desertrians appear one after the other. They realize they're surrounded by countless Desertrians!! The Desertrians were created from the Heart Flowers of elementary school students. Cobroger zeroed in on the Heart Flowers of students that were wilting because they weren't doing their summer homework. The Desertrians try to destroy the school after being tempted by Cobroger. Blossom and Sunshine face them to stop them. But Marine can't fight as strongly as she usually does... Will she realize the importance of homework?? Summer vacation is over, and school starts today. But Potpourri can't play with Itsuki while she's at school. He throws a tantrum, saying he wants to go to school with her, and embarrasses her. Finally, Itsuki scolds him. Potpourri is shocked, and flies away to the botanical garden. Alone at the park, he meets a little girl name Haruka. Haruka has run away from home as well. He decides to run away with her. Itsuki is looking for Potpourri. It's started to rain, but she desperately searches even as she gets soaked. Meanwhile, a telelphone pole Desertrian appears in front of Potpourri and Haruka! It's the autumn school festival, and the fashion club is planning on holding a fashion show. Erika's going to ask her older sister and popular model Momoka to appear in that show, and the members are super excited! Tsubomi thinks Yuri should appear in the show as well. Tsubomi and her friends go to the high school Momoka and Yuri attend. Momoka says it's okay. But Yuri refuses. Why...? Tsubomi drops by the botanical garden, where Yuri and Kaoruko are talking. Listening to their conversation, she finds out that Yuri has a reason she's always sad. Meanwhile, Sabark gives bracelets to his subordinates. By using these, they can increase the power of their Desertrians. Having obtained a new weapon, Sasorina targets Pretty Cure!! 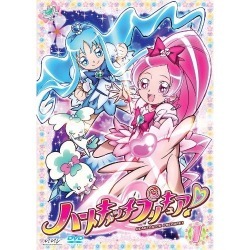 Long ago, Cure Flower obtained an amazing power. With that power, the stronger Desertrians should be able to be defeated. That power is the Heartcatch Mirage. It's in a castle called the Pretty Cure Palace. After Tsubomi and her friends ask Kaoruko, she opens the door to the castle. They realize they're in a forest engulfed in fog. Beyond the fog, a beautiful castle appears. It's the legendary Pretty Cure Palace! 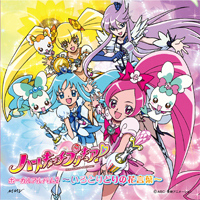 Tsubomi and her friends transform into Pretty Cure and enter the castle. They continue into a spacious dance hall, and Kaoruko is standing there!! She tells them they have to win in a fight in order to get the Mirage. Then the cute guy who saves them when they're in trouble appears! N-No way!! They can't fight him!! But the man attacks without going easy on them. It's Pretty Cure vs. the cute guy. And then his true identity is revealed...!! Cure Moonlight has finally been revived!! Moonlight is really strong! She intensely counters Dark Pretty Cure's attacks with amazing speed!! Blossom and her team didn't stand a chance against Dark Pretty Cure, but...wow! In the previous battle, Dark Pretty Cure defeated Moonlight. But this time, she can't lose if she wants to protect everyone. She takes out the Moon Tact and attacks with Pretty Cure Silver Forte Wave! Dark Pretty Cure also uses her Tact, to counterattack with Dark Forte Wave. The moment the two lights collide, there's a great explosion...!! Meanwhile, Kumojacky and his team, power increased by the Dark Bracelets, attack Blossom, Marine, and Sunshine. The decisive battle between all four Pretty Cure and the Desert Apostle executives!! It's almost time for the school fall festival! On this day, the shops and haunted houses are opening in the school. Of course, all of the students are making them themselves! In addition, there'll be dancing, movies, and other fun events. 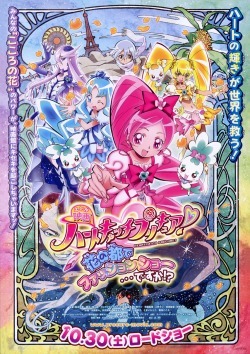 Ban is making a Pretty Cure comic book, and Kanae is displaying her photos. The fashion club is super busy preparing a fashion show as well. Tsubomi wants Yuri to wear the costume she made, but they can't find her no matter where they look. The performance is tomorrow! Even so, where on earth is Yuri? Meanwhile, Kumojacky approaches Gou from the film research club, takes his wilting Heart Flower, and makes a Desertrian appear in the school. Seeing this, Tsubomi and her friends want to transform into Pretty Cure right away. But Ban is with them, so they can't... Just then, Cure Moonlight appears before the Desertrian!! The day of the school festival has finally arrived!! The school is crowded with food stalls and customers! Everyone is here to see, including Tsubomi and her friends' parents! The fashion show performance is approaching as well. The fashion club will be the very last group to use the stage! It'll be the most climactic show! Hearing they're the last show scheduled, Tsubomi can't stop worrying. On the other hand, Erika and Itsuki are burning with passion!! Meanwhile, there's been an outbreak of trouble in the pop music club. The singers, Aya and Mayu, suddenly refuse to go on stage. Without the singers in the show, the audience boos them! Then the narcissistic Cobroger appears and starts singing. At this rate, the school festival will be a wreck!! What will Aya and Mayu do, and how will Tsubomi and her friends' fashion show turn out? Dune, the desert king, is the very menacing king of the Desert Apostles. He's finally approaching Earth!! And he's shooting Desert Seeds toward the planet. The Desert Seeds will produce monsters called Desert Devils to make all the greenery on Earth wilt. At this rate, the world will be in danger! 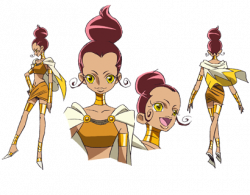 Tsubomi and her friends want to get stronger so they can defeat the Desert Devils, so they head to the Pretty Cure Palace. Here, Pretty Cure receives their final test... If they can pass it, their power will increase drastically!! Cure Blossom's training opponent appears before her. And that opponent is...Cure Blossom!! What?! She's fighting herself?!! Marine, Sunshine, and Moonlight each stand before their "shadow selves." And the bewildered Pretty Cures are attacked! The Desert Seeds approach the Earth with amazing speed. Marine and the others put their trust in Blossom. But the seeds have quickly fallen, and they produce enormous Desert Devils! 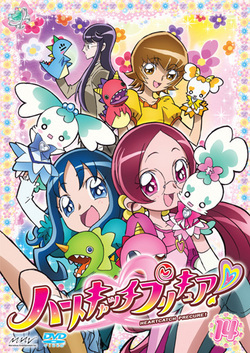 The Devils target the Heartcatch Mirage. Pretty Cure Forte Wave! Pretty Cure Floral Power Fortissimo!! The three attack simultaneously!! But all their attacks are brushed aside. If the four of them aren't together, they won't stand a chance against the Devils! Will Blossom return...? Blossom watches the others in their bitter fight as she battles her shadow self. She has to get back to everyone, quick! While she fights, she suddenly realizes something important. And...when the four Pretty Cures are lined up before the Mirage, a new miracle occurs!! The Marine Tact is a very important weapon that Cure Marine uses when facing the Desert Apostles. Even so, Erika tries to use it to clean the house and give herself a face massage. And then she falls asleep, leaving it unguarded! Angered, Coffret takes the Tact and flies out of the house! He finds Rumi and some other kids in nursery school at the park, and lends them the Tact. They start pretending to be Pretty Cure with it! However, Sunakeys from the Desert Apostles suddenly appear and take it!! Trying to regain it somehow, Coffret desperately hangs onto the Tact... Then Erika comes to help! She transforms into Marine and takes out the Sunakeys one after the other, but there are so many, and they're quickly approaching! Without the Tact, she can't use her attack! She and her partner Coffret can't work together well!! Marine's in a huge pinch!!! Sasorina is always defeated by Pretty Cure. After being exposed to too much of Pretty Cure's sacred light, her evil power is weakening! Kumojacky and Cobroger worry about her, which bruises her pride so that she goes off to challenge the girls to a final battle! Her target is the downhearted student council vice president, Satou. She produces an enormous Desertian out of the school building with his Heart Flower! They've never seen a Desertrian this big! The girls transform into Pretty Cure and go to stop the school building Desertrian rampaging through the campus. But Sasorina is different from usual today... She takes out the evil power residing in the Dark Bracelets...all three of them!! Sasorina combines with the Desertrian and attacks with the three Dark Bracelets...! Pretty Cure's in a huge pinch!! Tsubomi and her friends put on a puppet show with Chypre, Coffret, and Potpourri at the nursery school! 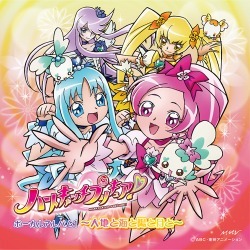 Taking on the role of the puppets, Chypre and the other fairies really get into pretending to be Pretty Cure! The nursery students are overjoyed, and the show is a huge success! They stayed quiet during the puppet show, but the truth is, they only act naughty and spoiled in front of Ms. Noriko. Ms. Noriko is worried that she can't take care of them. Kumojacky targets her Heart Flower and makes a Desertrian out of a monster puppet that rampages through the nursery! They get scared, wondering where their teacher is. Tsubomi and her friends transform into Pretty Cure and face it, but the crying children run toward it and shout out, "Bring back the teacher!!" Noriko's heart hears their voices, and for a moment the Desertrian stops moving... At this rate, will the Desertrian change back to Ms. Noriko...? 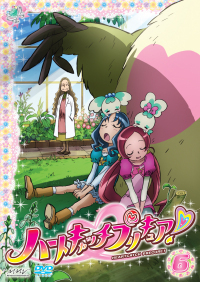 Tsubomi and her friends find a letter sealed with a heart in front of the botanical garden. Could this be a love letter?! But nothing is written on the envelope, and they don't know who sent it or who it's for! They're very worried about what's inside, but since they don't know who it's for they're not sure how to go about reading it... Even so, Potpourri opens it! The letter starts out, "For the longest time I've always loved you..." Having confirmed it's a love letter, they wait anxiously for its recipient to be revealed! Then Tsubomi and her friends find a boy looking for something in the grass; it's the writer of the love letter and Yuri's young childhood friend, Hayato. He wrote the letter for Yuri, saying he wants to protect her smile. They help Hayato give the letter to Yuri! Their plan is to get the two of them alone at the park. But not knowing his feelings, Yuri talks about when they were little, treating him like a younger brother. Hayato is deeply hurt... And Cobroger uses his Heart Flower to make a love letter Desertrian! Pretty Cure immediately rushes to the scene to face it! But as the Desertrian shouts "I'm not a little brother! ", Moonlight is bewildered... What will she do about Hayato's feelings...?! The Hanasaki family has big news!! Tsubomi's mom is going to have a baby!! New big sister Tsubomi is very eager to help out at the flower shop in place of her! Hearing the discussion, Erika, Itsuki, and Yuri come to help out, too! Everyone has on aprons and plenty of fighting spirit! Then a six-year-old girl named Kasumi comes with her grandmother to make a bouquet. She's going to give it to her mother and father as a present. But for some reason she seems lonely...why? The next day, Tsubomi and her father ask her. Kasumi says her mom and dad always just work and can't play with her. They've only been giving affection to her little sister and seem to have forgotten about her... Then Kumojacky makes Kasumi's Heart Flower into a Desertrian! Blossom transforms into Pretty Cure and asks the Desertrian Kasumi a question: "You should be having fun now that your sister's born! You really love your sister too, right?" Desertrian Kasumi's heart trembles... Then Marine, Sunshine, and Moonlight show up, too... Will Pretty Cure be able to save Kasumi?! Christmas will be here soon! The fir trees in the botanical garden have transformed into sparkling Christmas Trees! On one of those days, Tsubomi hears seven-year-old Mayuka tell her classmates that she'll take them to meet Pretty Cure on Christmas Eve. But she's lying to make friends with everyone. Shy and not good at making friends, Mayuka reminds Tsubomi of herself when she was little, and she understands how she feels. She kindly tells her that Pretty Cure probably won't visit people who lie, but promises that they'll come if she doesn't lie anymore. On Christmas Eve, Tsubomi and her friends stand near the Christmas Tree to keep that promise. Then they're informed of a Desertrian rampaging...! Bewildered, they head over to fight it. They have to get back quick, or...! Meanwhile, Mayuka and her friends are waiting for Pretty Cure at the tree, but they haven't come yet... Just then, the Desertrian shows up to knock over the tree! The children are in danger! Then Pretty Cure appears in a sacred light!! It couldn't be...the legendary warrior Cure Flower?!! Dune, king of deserts, has appeared at last...! 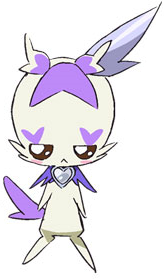 He's come to regain the evil power that Cure Flower sealed in the Heartcatch Mirage long ago! Blossom and her team try to protect Cure Flower, but they're no match for Dune's strength...! When his dark power flies at them, they're detransformed and turn back to normal. As this happens, Dune vanishes, taking Kaoruko with him. He takes her to the Great Tree of Hearts and, knowing his power is sealed within her pendant, smashes it, restoring his full power! And then he lays his hands on the Great Tree of Hearts...!! Meanwhile, Tsubomi and her friends wake up in Kaoruko's botanical garden. But as they listen to the fairies, they're shocked. The Great Tree of Hearts has started to wilt! They look outside, and the town is covered with sand! Tsubomi and Erika's stores have both been buried in sand as well... Dune has made the entire world into a desert...!! What in the world do they do now...? Pretty Cure goes to the secret base where Dune is to help Kaoruko. Kumojacky and Cobroger have been on the look for them inside the castle and block their path. If they don't hurry, Kaoruko will be in danger...! Then Marine steps forward to face them. Two fights, Marine vs. Kumojacky and Sunshine vs. Cobroger, have begun!! Marine sends out super strong kicks and punches, but Kumojacky shows no concern. He summons enormous dark power with the Dark Bracelet, and Marine is sent flying... She's in a huge pinch! Then Coffret summons the courage to fly toward Kumojacky...! Meanwhile, Sunshine blocks Cobroger's attacks with all her might. Just when she can't take it any longer, Potpourri blocks Cobroger's way...! Blossom and Moonlight, who were able to go on ahead, encounter Dark Pretty Cure before them! Moonlight has decided to face her on her own, and undertakes the battle. With faith in their teammates, Blossom and Chypre head to Kaoruko by themselves. Will Marine and Coffret be okay?! What about Sunshine and Potpourri?! Will Blossom be able to save Kaoruko...?! Cure Moonlight and Dark Pretty Cure continue their intense battle... Having safely rescued Kaoruko, Blossom hurries to her. Meanwhile, Cure Marine and Cure Sunshine are surrounded by Sunakeys who only show up again no matter how they defeat them. They're endless! The only way to get away is...to disguise themselves as Sunakeys. Everyone is surprised by Marine's idea! But Marine, Sunshine, Coffret, and Potpourri all impersonate the Sunakeys... It's a huge success!! Somehow they're able to slip out of their location. At the same time, Blossom watches over the fight between Moonlight and Dark. Moonlight thinks that she won't regain her old self unless she defeats her on her own. Then Professor Sabark appears. At that point, Blossom remembers Kaoruko telling Moonlight not to fight with him, but his intense energy waves blow her away. Blossom and Moonlight are exhausted after a combined attack from Sabark and Dark, but despite it they don't give up...! They muster up enough strength to face the pair again! Then with Pretty Cure's attack, Professor Sabark's mask is broken...! Who is the real person beneath his mask...?! There's no way Professor Sabark is...!! Blossom and Moonlight are shocked to learn his true identity. Why did he become Professor Sabark...? Long ago, the professor encountered Dune when he found the Great Tree of Hearts. But when Dune forced a mask of evil onto him, he became his servant. Furthermore, he also tells them how Dark Pretty Cure was created. Then suddenly, Dune appears sneering above him, explaining how his research helped to destroy the Great Tree of Hearts. Dune used Professor Sabark to turn the earth into a desert. Something like that can't be forgiven!! Yuri charges toward him in anger, but is stopped by Blossom, begging her to stop fighting with hatred and vengeance. Yuri realizes what she says. Pretty Cure doesn't fight with hatred, but with love...!! Erika and Itsuki rush to the scene, and that's when the final battle begins...!! Dune has finally revealed his menacing true form. 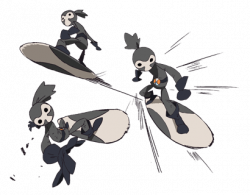 Blossom and her team powerup with Super Silhouette and face him! Fifty years ago, Cure Flower defeated Dune on her own, so they don't have anything to be afraid of! Blossom, Marine, Sunshine, and Moonlight - and Chypre, Coffret, and Potpourri. The seven of them combine their power into one and resist a power stronger than ever before, Dune...!! And they release Heartcatch Orchestra on him with all their emotion! But...! Will Pretty Cure be able to save the Earth...?! It's the emotional finale! This is the capital of flowers, Paris! Tsubomi, Erika, and Itsuki are super happy to see the Eiffel Tower! Why are they in Paris, you may ask...Fairy Drop, the shop Erika's mom runs, is advancing into Paris! The girls will model in the debut fashion show!! Erika's sister, the active model Momoka; Yuri Tsukikage, previously Cure Moonlight; and of course, Chypre, Coffret, and Potpourri are coming, too. Tsubomi and her friends immediately explore stroll around the stylish city of Paris. But for some reason the city is full of policemen?! Rumors have been spreading throughout France of a werewolf who appears on full moon nights... At that time, Tsubomi, remembering what her grandma said, looks for the many flowers in Paris, when the werewolf as his normal self, a young boy named Olivier who's terribly wounded, falls from the sky in front of her?! Olivier collapses before their eyes, and they take him back to their hotel and take care of him. However, he comes to and escapes out the window. The room is on the third floor, too... Tsubomi and her friends hurriedly chase him down after, when this time a Desertrian appears in front of them?! Why is there a Desertrian is Paris...?!! 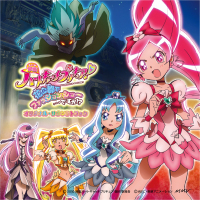 Tsubomi, Erika, and Itsuki immediately transform into Cure Blossom, Cure Marine, and Cure Sunshine! But the Desertrian that's appeared is Olivier!! 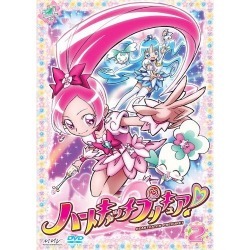 Cure Ange: The very first Pretty Cure to protect the Great Tree of Hearts four hundred years ago. 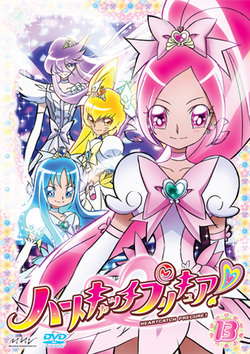 "Heartcatch Pretty Cure!" OP & ED Theme: Alright! 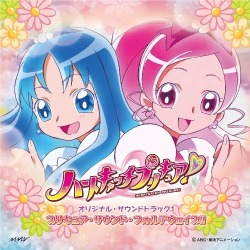 Heartcatch Pretty Cure / Heartcatch☆Paradise! 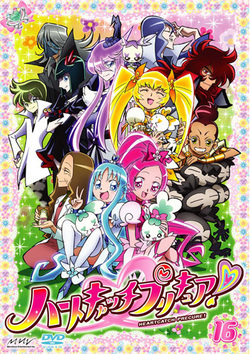 "Heartcatch Pretty Cure!" 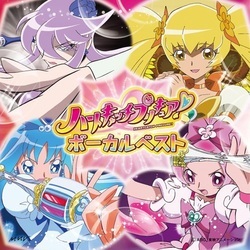 Original Soundtrack 1: Pretty Cure Sound Forte Wave!! 1. Pretty Cure Open My Heart! 12. Pretty Cure Pink Forte Wave! 22. Pretty Cure Blue Forte Wave! 29. 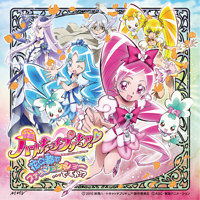 Pretty Cure Floral Power Fortissimo! 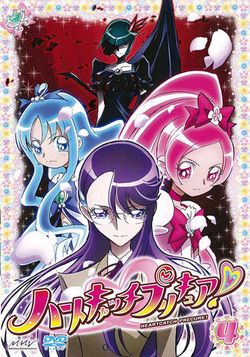 Heartcatch Pretty Cure! 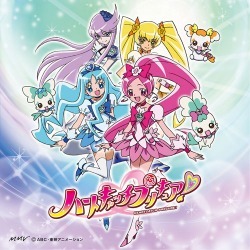 ED Theme 2 "Tomorrow Song ~Ashita no Uta~" / Insert Song "HEART GOES ON"
Heartcatch Pretty Cure! Insert Songs: "Power of Shine" / "MOON ~月光~ ATTACK"
3. Alright! 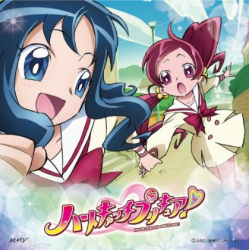 Heartcatch Pretty Cure! 31. 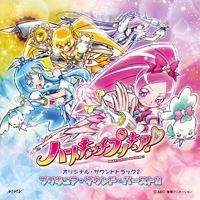 Pretty Cure Heartcatch Orchestra! 32. Pretty Cure Heartcatch Orchestra! 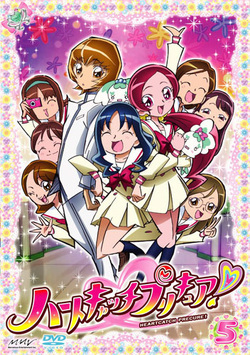 Heartcatch Pretty Cure! Theme "Alright! 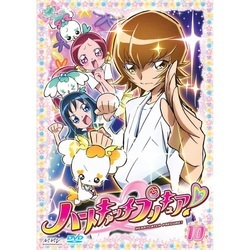 Heartcatch Pretty Cure!" Run your own shop and make clothes! -Make accessories and you're done! Dress Pretty Cure up in clothes and put them in a fashion show! 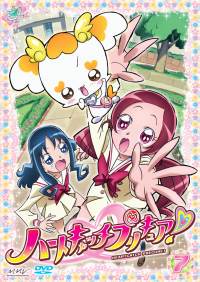 Koe de Asobou (Let's Play with Voices) Heartcatch Pretty Cure! -First, choose your favorite scene in the Studio! -Next, choose whose voice you want to perform! 18 characters are available, plus karaoke for the OP and ED themes! -Then speak into the mic! -Try editing what you recorded! -Save your favorite recordings for the Sound Room! -Collect special cards on the way - see if you can get all 60! -Learn a new hanakotoba every month! 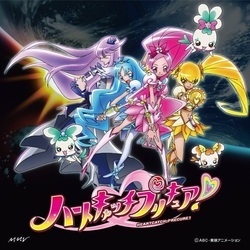 Tsubomi Hanasaki, Erika Kurumi, and Itsuki Myoudouin, upon meeting Chypre, Coffret, and Potpourri, become Cure Blossom, Cure Marine, and Cure Sunshine, and battle the "Desert Apostles" who want conquer the world and turn it into one giant desert. Standing in their way is Dark Pretty Cure. The development of her past is filled with bitterness. 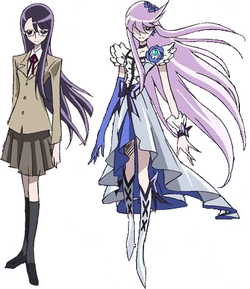 Moreover, will Yuri Tsukikage, who's lost the power to transform, be able to become Cure Moonlight again? Cover illustrated by popular character designer Yoshihiko Umakoshi!